Looking for data about Missouri? 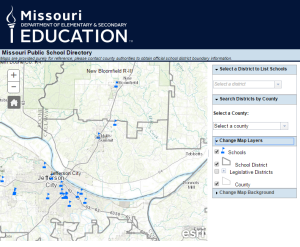 Visit the Missouri Spatial Data Information Service (MSDIS), the state's spatial data retrieval and archival system. The Office of Geospatial Information (OGI) was formed to improve the sharing of location based resources and technologies. The majority of information collected and maintained by the state contains some sort of location information. Whether a record contains a latitude/longitude, address or a county name, this information can be analyzed and displayed based on its location. OGI coordinates and supports Geographic Information Technology (GIT) for the State of Missouri. Oversight includes all technologies related to the discovery, analysis and relatability of information based on its location. Technologies include Geographic Information Systems (GIS), Global Positions Systems (GPS), remote sensing and geocoding. OGI offers professional cartographic map services to the agencies it supports, and can create a variety of different custom maps in different styles and formats. Online maps with custom tools are also available. The mission of the OGI Office is to facilitate the use of geospatial technologies and to coordinate the standardization of geographic data, software, and methodologies within state government. The Office of Geospatial Information OGI) provides a variety of professional services in the area of mapping, geographic analysis and location based services. Project costs will vary based on the complexity and the amount of resources required. Data relationships are often discoverable only when analyzed in their geographic context. OGI can assist users in the process of looking for patterns and relationships using their agency’s specific data using a variety of GIS analytical tools. OGI offers professional cartographic map services to the agencies it supports, and can create a variety of custom maps in different styles and formats. OGI designs and builds online interactive maps that can be shared within your organization and the public. Maps may be standalone, or a component to be integrated into a larger application as a GIS map service. It is quite challenging to incorporate GIS functionality into an existing application. Any agency or user who might consider this a need, or future need, should contact OGI to make sure the data is structured in such a way to make it GIS-friendly. View complete list of online maps. OGI works with state agencies to convert digital information into meaningful and reliable GIS database layers for your organization. OGI can provide best practices guidelines for the collection and storage of spatial data, including addresses, latitude/longitude, county name or census geography. We can help in design activities and the review of applications or workflows requiring a spatial component. OGI offers free GIS training courses to state employees. Submit an email to MO.GIS@oa.mo.gov for additional details. GIS is essential in all phases of emergency management; preparation, mitigation, response and recovery. GIS allows information to be visualized spatially, shared among state agencies, and updated real time empowering decision makers, saving lives and cutting costs. 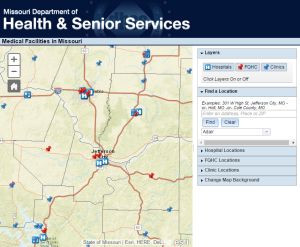 GIS is an integral part of Missouri’s WebEOC.